Traditional pliers are okay for everyday use, but if you plan to do some serious welding you better get yourself a pair of quality MIG Welding Pliers. No matter how great your portable MIG welder is and no matter how good of a welder you think you are, you need to keep a pair of pliers handy to trim the MIG wire and clear your nozzle. This is where specialty MIG Welding Pliers come in. They have a long and narrow tip that is great for cleaning weld spatter from the inside of your MIG Gun Nozzle. When I weld, I keep a pair of MIG Welding Pliers in my back pocket at all times. They sure do come in handy! When it comes to quality, you can’t beat the Channellock brand of MIG Welding Pliers. Channellock has been manufacturing high-quality tools since 1886. 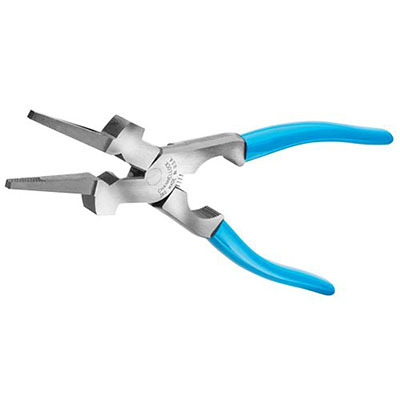 Today, they utilize state-of-the-art machinery to produce a precision, heat-treated edge on their pliers. You can try a cheaper brand if you like, but they won’t last as long or perform as well, as the genuine Channellock product.